Free Italian Ice @ Rita’s March 20th!! 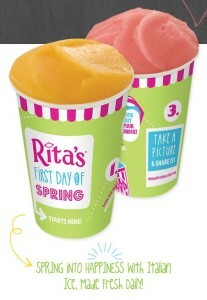 Every year Rita’s kicks off the first day of Spring with a FREE Italian Ice for everyone! No coupon required. Rita’s stores are open from noon to 9PM and you can find your nearest location HERE! Share your experience on your social networks with the hashtag #RitasFirstDayOfSpring for a chance to win sweet prizes too!